and for this week's One Layer Wednesday challenge, hosted by Karen, to make a card that makes you smile. Rainbows make me smile, Stickles (ok, anything shiny) make me smile and celebrating makes me smile! (and so does the clean font of this Stampin' Up sentiment!). Masking finally made me smile on the fourth attempt! lol! What makes you smile? 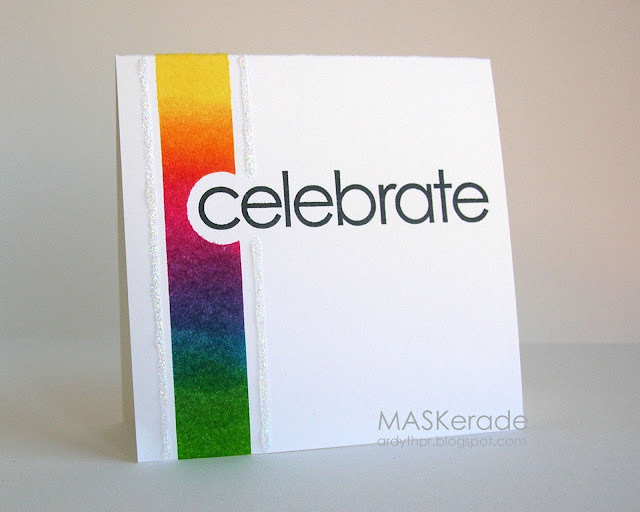 Why not whip up a one layer card and link up to this week's challenge? I'd love to see what you come up with! So chic and so happy! Your card made e smile, gorgeous! Rainbows make me smile too! fabulous gradient color! Soooo pretty Ardyth. Perfectly CAS. Absolutely gorgeous - so clean and simple yet totally celebratory!! So glad to see you at CAS(E) this Sketch! You rocked it!! Love the rainbow and sparkle - this is just so you! Love it! Your creatvity is just amazing! I lurve this one! Ardyth, you are always so creative...I LOVE the bright colors and the sentiment couldn't be more perfect! Love your take on the sketch, fabulous card! I'm smiling....awesome card, flawless stamping! You have just inspired me to pull this stamp out of the box under my desk!!! WOW - this is gorgeous!!! Love the glitter, too! Fantastic card! What a great take on this sketch!! So clever! What a fantastic card, love the rainbow and glitter borders! That touch of glitter on the edges of those vivid colors looks sensational! Well done! Just like you, I love rainbow and glitter (and this font) and so this card totally makes me smile! Thank you! This is great! Love the glitter and rainbow. So creative use with the letter "C". Ah, my favorite card by far for the sketch this week! What a HAPPY card...this definitely makes me smile! OK, really, what else belongs in the middle of that opening but a "c"? It's so obvious, now that you've shown us the light! Perfect take on the sketch, Ardyth! eeek, this is brilliant... beautifully done. thanks for playing with us at cas(e) this sketch!!! I love rainbows too so this card had the desired effect. Great font! This is gorgeous!! LOVING how you created the rainbow, especially with the two strips of glitter on each side! The sentiment font is fabulous too! Smile. Check. CAS. Check. Graphic. Check. Fantastic. Check.